I know I know, how did it take me so long to see this film? I have no idea, but I can agree with everyone that this film is amazing! 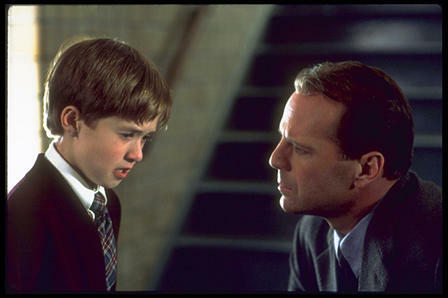 The Sixth Sense is one of those films that only comes along every once in awhile, a truly inspired piece of work! This wasn't my first exposure to the film, however. For my directing class we had to do an exercise where we read the script for this film, chose a scene, and then described how we would have directed it. It was helpful having not seen the film for the exercise because I wasn't influenced at all by M. Night's masterful directing and could let my mind have free reign. But, unfortunately, I already knew the ending, and while I knew what was coming, it actually helped knowing the story because I was able to see everything clearer and really notice how great a job of directing M. Night really did. Again, inspired! M. Night knows how to do suspense well. Everything from the sound design, choice of shots, acting, and especially all that he doesn't show you in the frame, combines to make an excellent film that will certainly keep you on the edge of your seat, even if you know what's coming. He utilizes a lot of long shots in this film, especially one's facing the character, that only show us how they are reacting, but leave to our imagination what they are actually seeing. He uses every aspect of filmmaking to tell this story and is a master of knowing exactly what to include to keep your mind in suspense. The premise of the story is so cool as well (though still a little creepy...). 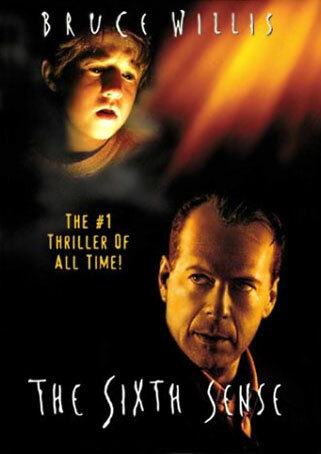 Cole is a young boy who can see ghosts of dead people, and lives in constant fear of them. What Malcolm gets him to realize, though, is that these ghosts are coming to him for help. They all have things they left unsaid or undone, and these things seem to keep their ghosts around. The ghosts don't realize they are dead because they still have things they need to "live" for. And they come to Cole because he seems to be the only one that can help them. And once he learns that it's his job to help them, they can rest in peace and they no longer haunt him. They are only frightening if Cole is afraid of them.